IT'S THE MOTHER EFFING YAH MINECRAFT THREAD. TALK. ADVICE. SMP. PICTURES OF OCELOTS. Edit: IRG has a Minecraft server! sunlitgarden.fluctis.com is what you put into the address field, but it's whitelisted -- post here and we'll get a pick in your hand in no time! I didn't know Minecraft had updated until I saw Bio's post yesterday, actually. So I made myself a new world and a new friend. This is a towerish thing I made in my previous world. I should have used more End Stone on it. At the time it was the highest point in the world, just as Akio prefers, but with the new version it could be at least twice as tall. Making the roof out of netherrack and lighting it on fire seemed like a neat idea at the time, but it's hard to appreciate when you can only view it from below. It's also really noisy. I love the idea of a multiplayer server, but have no idea what it entails. It must cost money, no?, unless someone wants to run an always-on instance of Minecraft on their own computers. OITL, I like the mining pattern you described Two of my three tunnels became fiery infernos when I tunneled into lava, but that just means I learned how to deal with a lava incursion. And resources of all kinds are evidently A LOT more common down near the bedrock, which made me happy!! Yes, MC servers do cost money, but at the moment, with the amount of people that I imagine we'd have... what, maybe 10 of us at a time? Based on pricing I've looked at, renting server space for a group our size would be somewhere in the $10-$20 a month range, depending on the size of the world we end up creating and what if any mods we may want on the server. That's really not a terrible price to me. I mean, it does add up, but... a lot of games have added costs, but I'd bet it's cheaper than something like WoW. Totally worth it though , that thing is awesome! I made my first Nether Portal! I like the portal. Putting together the frame and lighting it on fire is so trivial that you can almost forget the work it represents. I popped through just to get my bearings (and the achievement). I was so worried that I was going to end up like the guy in the tutorial, spawning on top of a tall pillar in the middle of a lake of fire. But no, my portal seems to be in a relatively safe bit of the Nether, situated on Netherrack that is mostly not on fire, with only a modest lava waterfall and river imperiling me and my belongings. I didn't even see any ghasts, though admittedly I didn't stay around to double-check. Any exploration tips? I built a big base, too. Well, I didn't build it so much as mining it. I had built my little house on stilts in a beautiful cove that faces the sunset, next to a hill maybe fifteen bricks high where I'd built a lighthouse. 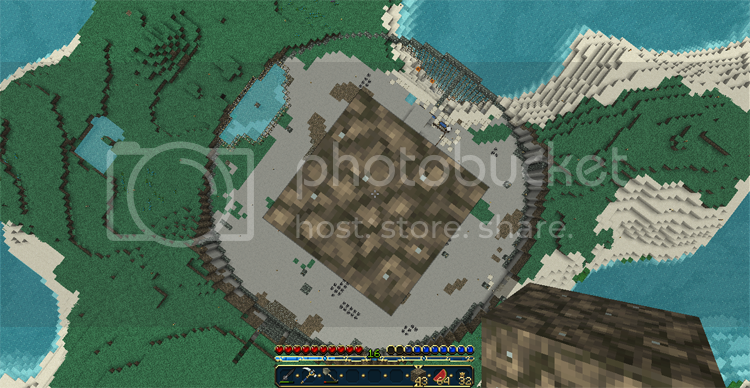 To build my base I just hollowed out the hill, putting big windows wherever the side was flat. 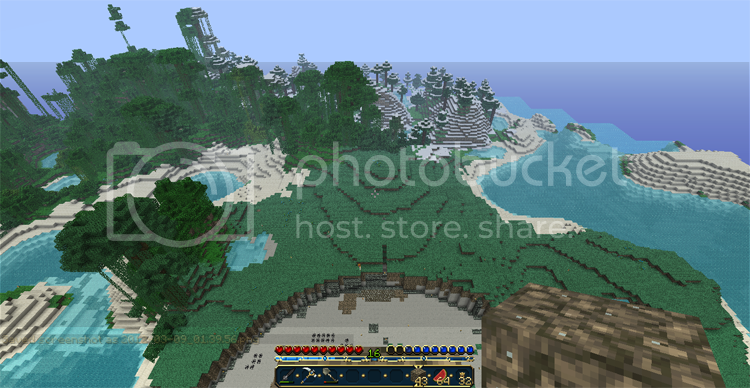 I spawned on a big peninsula that is about half forest and half taiga. You have to travel a long way to find interesting resources, and I have no clue how I'm going to farm sheep. But the sunset is a nice benefit of all that ocean. 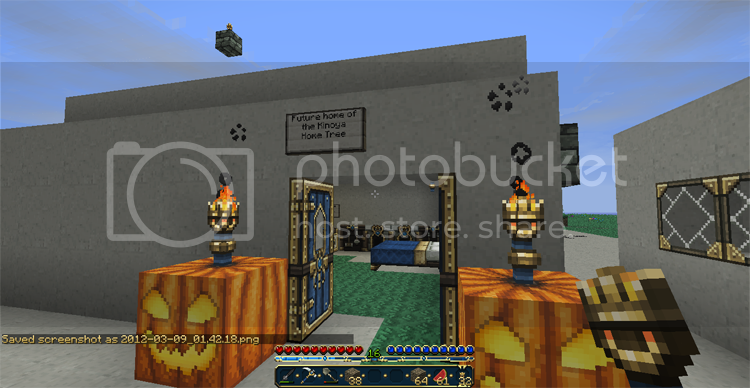 I spent a day once in creative playing with redstone and TNT. It was explosively informational. Also, the server I play on finally updated to 1.2, so I'm working on my epic tree build again. They decided to update the map, because of how cluttered the old one was. I had two above-ground floors and three basements on the last map, but I don't mind. I like building. This tree, it only has a radius of 35 blocks... and I'm working completely in survival... and I need to level the land... and they have mods installed so you can't use TNT... but it's all kinds of fun. 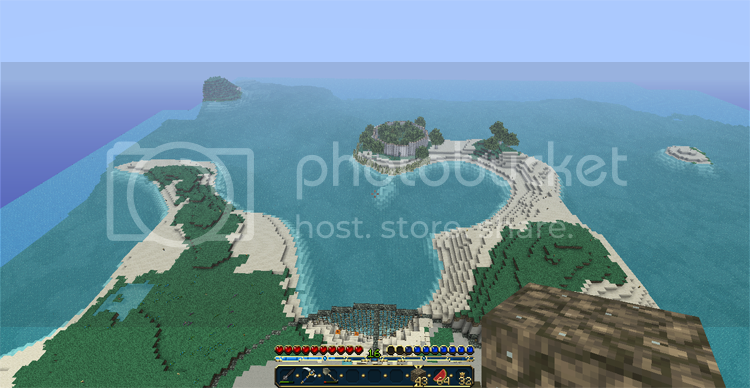 Spent a couple hours last night building a glass wall into the lake where the tree meets an ocean biome. That was an interesting experiment. Your tower is more than a little amazing itself, Rags The hill it's situated on is so perfectly bell-shaped; you must have had to terraform it endlessly. Did you use Creative Mode? It looks like dirt on the right, but what's going on on the left? Is it just stone, or is it a gaping hole that leads inside the hill itself? It's so much messy and in progress, but I can do some when I get on later tonight. Progress shots of the tree as it gets built might be a good idea anyway. Sat, you can farm sheep using wheat and shears. Wheat, when held in hand and near a sheep, chicken, pig or cow will attract it and it will follow you. Build and fence and gate and trap it there. Get two sheep and feed them both wheat, and they will produce a baby sheep! Left click on sheep while holding the shear to yield 2-3 blocks of wool, which they will grow back. You give me much too much credit! I didn't make myself a nice mountain, I just happend to find one and said to myself "Yes, this is a good place to put a tower." 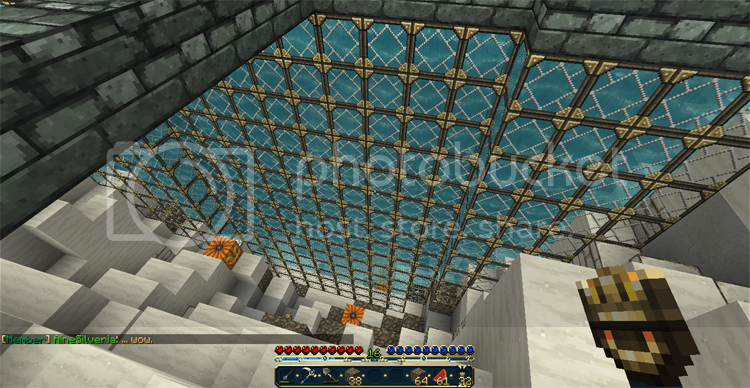 My only addition is the pillar of gravel in the middle which has a ladder scaling up towards the top. The left does have a chunk of open air, with a little bit of a cave in it, if I remember correctly. I'm proud of it as a first attempt, next time it'll be better! And taller. And whiter. Have you made any Snow Golems? Haha... I know what the mechanics of it are; what I meant was that I don't know where I'm going to find sheep, since there seems to be a lot of ocean around where I live. When I first spawned, there were sheep nearby. I didn't have any iron to make shears, but I knew I wanted a bed and figured I could always find more sheep later, so I killed the sheep. I thought I'd gotten all of them, but today I went to extend my road system back to my original spawn point in the taiga in case of catastrophe, and there were two survivors. One of them was killed by wolves before I could do anything. I led the other guy back to my base and built him a wolfproof fence, but I don't have anyone left to breed him with. Well, with patience I guess one sheep is enough for me to make all the beds I want. I have learned a valuable lesson about CONSERVATION! Afterwards I made another expedition to the Nether. It was surprisingly friendly. I learned that as long as you're paying attention, the Nether is not actually any harder to survive in than the overworld, but it is much harder to navigate. Nothing but lava and Netherrack as far as the eye can see, occasionally interrupted by glowstone. I need to find a Nether Fortress and I have no idea how! 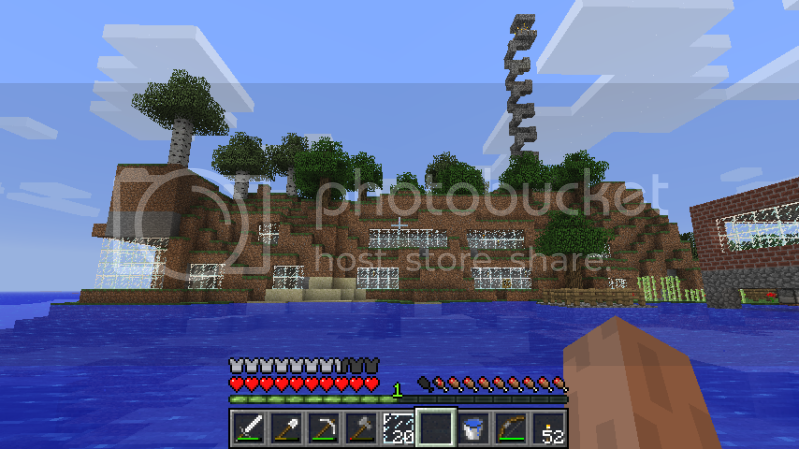 At least I came back with glowstone powder, and my lighthouse is consequently under renovation. At night it looks beautiful. So. I started a file today, a Survival file. (I kept it on Peaceful, but baby steps.) And in this file, all I knew was that I wanted to build a nice little house. Nothing ostentatious or massive OMFG COBBLE QUARRY involved, just a nice house that was pretty cozy. After a wrong step with my original file, I reloaded and got to serious work. When the island I was on couldn't provide any further, I built a boat and set off in search of fun, adventure and tons of resources. Boy howdy did I find resources. While searching for a good cavern, I found that swamp biomes have lots and lots of clay on the bottom of the water. As I like the way my texture pack portrays brick blocks, I decided to harvest some clay and save it for later. 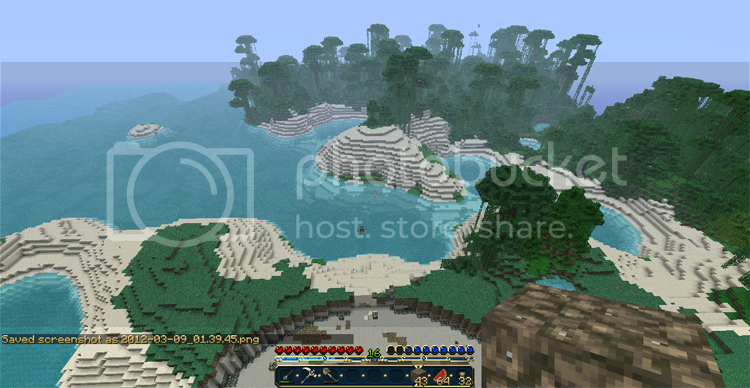 Then I switched biomes and got to business. After my biggest excursion on this file, in which I found an abandoned mineshaft but declined to explore (I was getting lost really badly and really quickly), I finally clawed my way back to the surface after about 20 minutes of desperate searching. (I did mention I was lost, right? ) The resources included 22 gold ores, about three full stacks of iron ores (pay attention to this), a stack and a half of Lapis Lazuli dye, half a stack of Redstone and almost two full stacks of coal. Oddly enough, my cobblestone supplies were woefully low, which probably had more to do with the fact that I was spelunking in natural caverns more than actually doing any true mining. When I got to the surface, I put together two furnaces and set to cooking what I had. In the meantime, I explored the large pond near the furnaces and found even more clay for the taking. The resulting displacement of water, air and block updates meant that the sand created a whirlpool into a cavern somewhere, but that was fixed later on with some dirt. Once all the clay and gold had cooked, I looked at a strange stack of blocks and hovered to see what it was. WHERE DID THIS STACK OF IRON ORE COME FROM OH GOD OH GOD. Turns out I hadn't paid enough attention in my mining to realize I had way more iron than I expected. Once that stack was cooked, I squished all the iron into blocks. In the meantime, I made a clock with some of my gold and Redstone, then set to cooking all the extra clay I'd taken from the pond. I then formed everything into clay bricks and crafted brick blocks. A stack of sand was also harvested and cooked into glass, which I then crafted into glass panes. That's when I set to work on my house. I used raw wood for the walls and created a sort of cube frame using bricks. Once the frame was made and the walls put up, I laid down the plank flooring and ceiling. Some of the glass panes went into a corner of my house, so I have a nice corner bay window; more glass went on the far side of the house, for extra neatness and security. A small hole was left in the ceiling to allow me to crawl up to the roof using ladders, and the roof perimeter surrounded with fencing. I placed a trapdoor to guard against rain and possible spiders, then set to work decorating the house. The crafting table I used throughout my adventure was placed to the side, alongside the two furnaces I'd used near the pond. 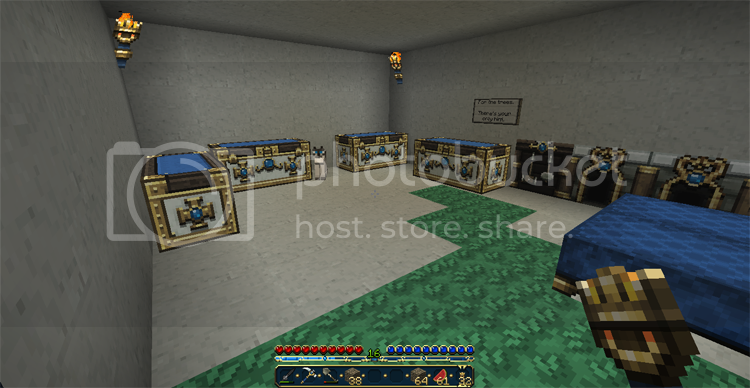 A pair of chests were placed to make a large chest; I'd obtained them in a dungeon very early into the file. A bed that had been made a while back was placed and then slept in as soon as the game would allow. The next step was to, as Aine and I put it, create a way to supply myself with noms. A small wheat/sugar cane farm was built, and most of my remaining torches used to cover the area around my house with enough light to deter as many hostile mobs as I could. Once this was done, all there was to do was wait and plan my next move. I'll have to now set the difficulty to Easy, since I saw at least two wolves around and I'd love to tame them for extra fighting bodies and, of course, because they're cute. I'll see what I can do about pics, as I don't have any right now. Wolves are cute, and they can be helpful for fighting. I don't recommend them for cave exploring and mining, though. They have a tendency to fall off things, but they also have a tendency to push you off things. If you're careful and have lots of meat for them it should be fine. Don't take this many. It never ends well. I had about 12 + wolves, but when Minecraft updated half of them disappeared. I will play Minecraft Classic. Any tips or whatnot for a noob? I played Classic once, a year or more ago It's quite different from modern Minecraft -- and fundamentally different from Survival mode. Classic doesn't have scarcity, nor much in the way of constraints on your creativity, so you can go to town! As far as advice, there's not much to give! You can't die, you can't run out of stuff to build with -- really, the only hazard is getting lost. Above ground, build yourself a nice tall tower on some high ground; as long as you can see that tower, you won't get lost. As you explore more and more, you may need to build some secondary towers on high ground that you can see the first tower from, and so on. That way you'll always be able to find your way back home eventually. You can build roads, too, though it takes a while. One good thing to know about building tall things is that you can place a block directly underneath you while you're in midair -- so you can build a tall 1x1 tower quickly by jumping and placing a block underneath you until it's tall enough for your satisfaction. Below ground, it's easier to get lost. Never tunnel straight down; you don't know what's directly below you, and if it turns out to be an enormous cavern you might have trouble finding your way out again. Tunnel down at an angle instead. (In an emergency, if you fall through a deep hole, you can use the tower-building technique above to go straight up again.) When you run into cavern complexes, leave a trail. One incredibly helpful technique that I owe to the tutorial videos OITL linked to a bit ago is the idea of marking your trail on the RIGHT, using some special block that stands out; I think Classic has funky purple blocks that stick out like a sore thumb. That way, when you want to go back to the surface, you just turn around and follow the trail on your LEFT. If you're consistent about this, you won't easily get confused even at crossroads. Oh, hai there. You found your way here. You're inside our little stone home. Don't mind the one with the scary sword, that's just my partner. I'm the one with the melon slices. This place you see around you, it's just a temporary place safe from the night's beasties. I needed somewhere to keep my kitty safe, and to store all my hard-earned treasures. This place will eventually grow to be a tree taller than the clouds. Here, let me show you around a bit more. I climbed up here to show you the outline of where the tree will go. That's as far as we've gotten. We had to clear out quite a bit of dirt and stone from around here so we could be sure that the tree grew straight and proud like we want it to. The glass wall is not an accident of poor planning or poor design. It was something we planned for and wanted the whole time. When we came to this new world, we wanted an underwater dome as well as our home tree. A root will grow out from there to be a safe passageway to our underwater place. This is the beginnings of a smaller tree. This smaller birch tree will be home to our animal friends. Well, not the wolves or the cats, but the livestock animals. It is better for all if they have their own home. (This project is epic and crazy and will eat my life. The main tree has a radius of 35 blocks. The secondary animal tree has only a 12 block radius. There's a third farm tree planned that will be about the same, as well as some variety of lighthouse, which shouldn't be too bad... Oh, and that underwater dome. WHAT IS WRONG WITH ME? I swear, I can't build simple and small. 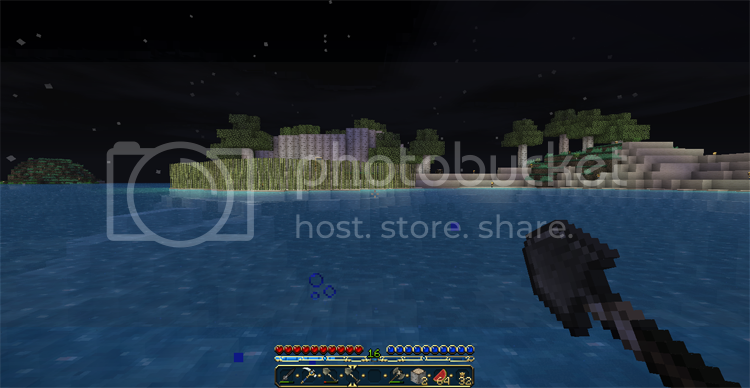 Aine, I love the texture pack! I have no sense of scale. When I saw this picture I thought for a moment that you had excavated a deep hole, and then filled it in with an enormous square that you had painstakingly designed to look exactly like a gigantic dirt block. That would be pretty amazing, but eventually I figured it out. Epic indeed. Where is the glass wall? Somewhere in the base of the big tree? Edit: Never mind, figured it out. Wow, that is beautiful. Let me know how the underwater dome works out. It's a really tempting idea but water is hard to work with, at least for me. I am getting really frustrated. I have combed the Nether looking for fortresses. I have dug up, down, and sideways. I've made a Creative Mode instance of the same seed so I could fly around looking for them. I've installed a texture pack that has better contrast between Netherrack and fortress tiles. I've turned up my screen brightness and turned down my screen brightness. I've installed AMIDST and built portals where it says I should have fortresses, and found nothing. I've searched the Minecraft forums, which are full of people with the same problem, and all I see is variations on "lol there is always 1 near ur spawn, u need to look harder." Well, I have looked harder, and there is no fortress near my spawn. Is there anything I can do short of restarting with a new seed? I have no idea, the new release might have messed them up though. Other than the possibility that structures were disabled when you generated your world, but I'm sure that's not the case. Nope, structures are enabled, and I've found NPC villages, so the game's generating them properly. Thank you for the thought, though! I'm actually still on 1.1, since 1.2 still looks buggy. I guess it's possible I should patch up to 1.2, delete my Nether folder, and regenerate it and see what happens? You may be walking right past them since they are so dark. This is what was happening to me. They would usually be looming over large pools of lava, but unless I was close I couldn't actually see them at all. If you are standing near a large lava pool try looking across it very carefully. They are seriously hard to spot. Other than that the only advice I can give is to listen closely for that that deep chiming sound -it usually means you are near a fortress.